Air Force Lt Col James Ayres died January 3, 1971 when the F-4E Phantom II aircraft he was piloting exploded and crashed while on a nighttime strike mission of enemy targets in Savannakhet Province, Laos. Shortly after Lt Col Ayres initiated a target run, the crew of another aircraft observed a large explosion. No one witnessed an ejection or heard beeper signals and communication was lost with the aircraft; hostile activity in the area prevented search and rescue attempts. Lt Col Ayres and his crewmate, Capt Charles W. Stratton, were listed as Missing in Action. In 2001, a joint U.S./Lao People’s Democratic Republic (L.P.D.R.) team, led by the Joint POW/MIA Accounting Command (JPAC), traveled to Savannakhet Province and interviewed Laotian citizens about their knowledge of aircraft crash sites. One of the men led the team to what was believed to be the Ayres and Stratton crash site. Later that year, another U.S./L.P.D.R team began excavating the site, recovering human remains and aircrew-related items. Between 2002 and 2005, joint teams visited the site six more times to complete the excavation, recovering more human remains and crew-related items. Among other forensic identification tools and circumstantial evidence, scientists from JPAC and the Armed Forces DNA Identification Laboratory also used mitochondrial DNA in the identification of the remains. Both the remains of Ayres and Stratton were identified in August 2007. Lt Col James Ayres was laid to rest on August 22, 2007 in Pampa, Texas. 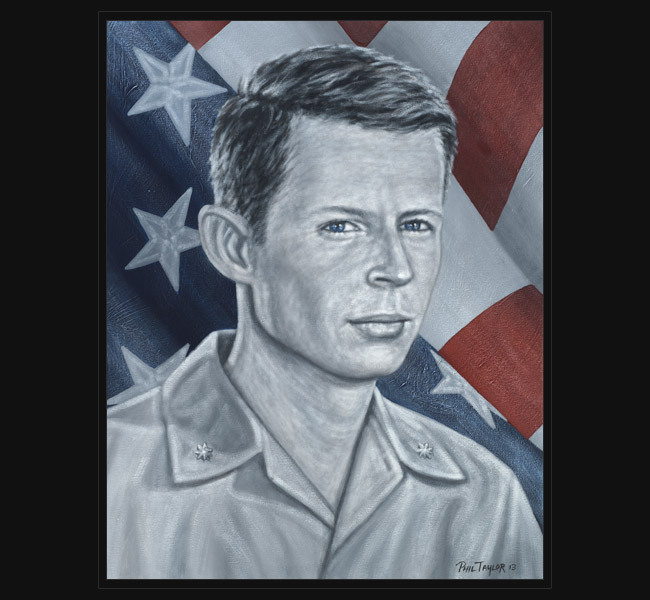 Original portrait was presented May 20, 2013 to his wife and adult children during a special memorial golf tournament hosted by G2 Secure Staff and Cage Inc.